Even if scientists have already debunked the Mayan Apocalypse myth, there is a lot of people who still take the alleged imminent end of the world quite seriously. People around the world is taking different precautions for the many ways the end of the world could become a reality by the end of the week, the most popular of those is the use of shelters or survival pods capable to withstand massive solar storms, huge waves, weather events and so on. However, if you were among the few U.S. “decision makers”, your escape plan would already have been established and your survival pod would come in the form on an E-4B plane. 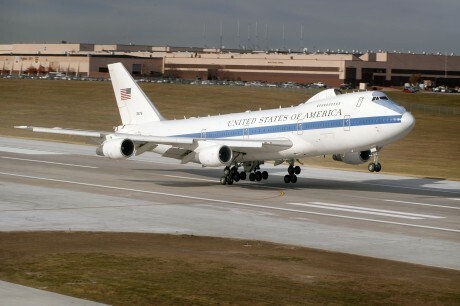 In the event of a war, a terrorist attack, a zombie apocalypse, alien invasion etc., whilst the President of the U.S. would be on board the Air Force One, the U.S. Secretary of Defense, the Joint Chiefs of Staff and other top personalities would be kept alive on board the U.S. Air Force’s fleet of four E-4B planes based at Offutt Air Force Base, Nebraska. The aerial platform (supported by several tankers) would give the U.S. military the capability to direct nuclear (and conventional) forces, by receiving, verifying and relaying EAM (Emergency Action Messages). The E-6B Mercury can do the same job. Built on the Boeing 707 airframe and using a B737 cockpit, this aircraft has a range of 5,500 miles, and accommodates 23 crew members. The U.S. Navy has a total fleet of sixteen E-6Bs. It can perform the so-called Looking Glass mission (mirroring the ground-based C3 center at Offutt AFB and relaying orders), it can talk to submarines trailing a 26,000 ft wire antenna, it can launch commands to ICBMs (InterContinental Ballistic Missiles) via Airborne Launch Control System, and can perform C3 (Command Control Communication) operations to forces operating in theatre. For this reason they are often deployed abroad: they were monitored in Iraq and have been deployed to the UK in the past. One E-6B mysteriously circled above the British islands during the Osama Bin Laden raid.